Dream Master is not quite the typical jRPG that one would expect from this time in console history. In some ways it tries new things and does them fairly well. Given the time frame this was released I think it’s worth the time of any admirer of the genre to find a copy. Dream Master is broken down into scenarios (nightmares) in which you as a dream master must enter a dungeon and survive long enough to beat the boss at the end. 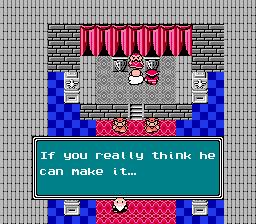 The story for the game is pretty cliché, where the big bad guy has captured the princess’s soul and you have to enter his ‘nightmares’ to save her. Each dungeon usually has previous dream masters which are stuck in the dream. Some of the locations are pretty strange, for instance one occurs in a underground city on Uranus. Most the ‘dreams’ start with a village that is tormented by the evil leader and his minions. From there you get the story of the villagers and maybe some items. From the village you enter the dungeon. Now what is different is that the dungeon floor can be hidden with ‘darkness’. Basically you cant see the walls and you must move around slowly revealing the tiles. But you must not try to hit the walls, since each time you hit one you lose 1 hp (more in later nightmares). If you don’t hit any walls for some time the evil leader will actually reward you with healing some HP’s. Also the floor can be haunted by various minor monsters. What’s nice feature is that the monsters occupy a tile on the map. They also produce ambient sounds that get louder as you approach them or they move towards you. One other thing you can see is places where items reside. Some floors can contain simple puzzles, but most of the time the goal is trying to find the ‘key’ item you allow you go onto the next floor. Some walls can be hidden passages, which open up when bumped. Monster battles are 1v1 (sometimes there is a companion npc, but I found they rarely affected the outcome). Battles mostly come down to the death by trading blows, but there are some twists that thankfully differentiate it from say dragon quest 1. 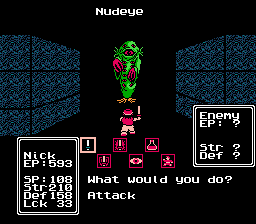 The battle commands for the player consist of choosing an attack between normal, defensive, and offensive, OR observe OR use item OR run. The monster when attacked can be targeted on a number of locations. Where this comes into play is that usually one of these points is a weak point. Using the observe command gives the player a chance to know this location. 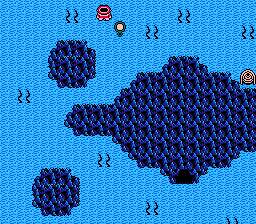 Knowing this location is key since you are highly motivated to defeat monsters quickly with little HP loss. In addition some monsters have a direction attack, so before the attack is made the player can choose a direction to move: left, middle, right. If you guess the right spot the attack can be avoided. Once winning the battle experience is awarded, which in turn after a certain amount is accumulated the play level increments and attributes increase. One interesting thing on this is that the game does not have a save battery so the game handles progress through a keyword. I used emulation and save states, so I never messed with trying this option. In summary main challenge of this game is HP management. There are no inns or stores. This game (outside the first map) has no way to repeatedly recover the players HPs. There are one time use potions, but you have to find them and there are usually only a few. There are ways to trigger a full recovery but these are always a one time deals. The negative side to this is that you could lose just by random bad luck by repeatedly not choosing the right direction to dodge. But the game does let you restart the current scenario if you do die. There are also various items to help. For example some items take away wall damage, perform special attacks, or reveal the area around the player temporarily. You can only hold 8 items, but what is neat is that items can be dropped and the game will remember their location. So you can come back to get something left behind. 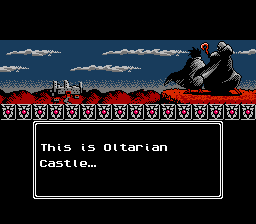 Graphics are pretty well done for a NES title. The sound and music are adequate. Complete patch for Dream Master game produced by Birthday. See Readme file for playing advice. Version 1.01 contains some corrections of major glitches.